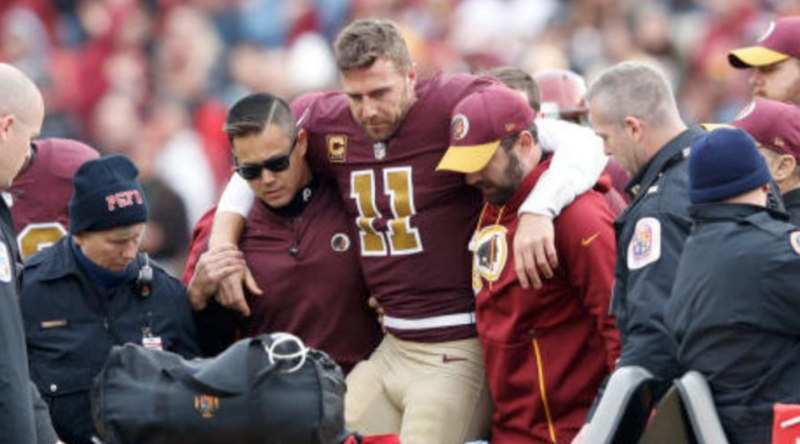 When Alex Smith went down with that gruesome injury back on November 11th, the Redskins were 6-3. Not bad. Their defense was one of the main reasons they held a winning record, but the offense was able to move the football as well. Alex Smith was a good quarterback for the Redskins. Now, before you rip on me and tell me how he stinks and he’s too old, I will stop you and say this: That’s not why we’re here. Instead, let’s look at the cage Smith has around his leg! Smith made an appearance at yesterday’s Wizards game and, of course, got all of the attention. I have never seen anything like that before, so if you have, feel free to fill me in on the details. Now to the blunt truth about his injury – there is no way Smith will be back for the start of the regular season. There were reports of him having to battle infections. Looking like the ‘Skins will open up the season with Colt McCoy as their starter?